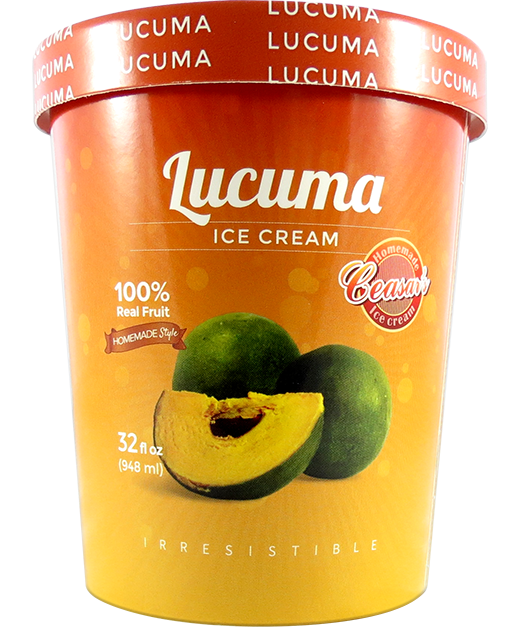 Made with 100% real pulp, our Lucuma ice cream is a blend of intense natural sweetness that combines our homemade flavors and evokes the vision of the wonderful Peruvian Andean landscapes. Lucuma, milkfat, nonfat milk, sugar, corn syrup, salt, buttermilk, whey, mono & diglycerides, guar gum, polysorbate 80, locust bean gum, carrageenan, artificial color, vitamin A, palmitate. A unique, maple-like taste makes our Lucuma ice cream one of the most peculiar flavors. Every bite instantly takes you on a tropical journey and inspires you to venture into new experiences. It’s smooth, creamy consistency takes your tastebuds on a wild adventure through the most emblematic places of tropical countries. Each batch symbolizes the beauty of nature and life, taking you on an excursion where the experiences you enjoy outdoors make you smile involuntarily. No matter what this flavor symbolizes for one another, it will always be the perfect way to make your days brighter and your life more complete.